When your produce stays fresher longer and loses less weight, your business can be more profitable. A CRP floor cooler solution from Bradley Refrigeration could help you achieve all three. We’re the market leaders in CRP floor cooling, with 50 years of refrigeration experience to our name. So your business can benefit from the most reliable and energy-efficient system, custom-designed for the scale you require. Based in Sheffield, we design, manufacture, install and maintain solutions for agricultural customers across the UK. Proven solutions, industry-leading efficiency and a huge range of customisation options make Bradley Refrigeration the agricultural industries’ premier choice. Get leading performance from your equipment, while keeping costs low. Your system can benefit from a high-efficiency cooling coil. 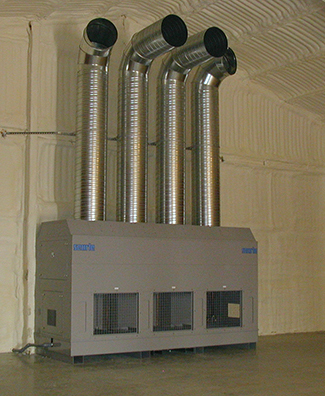 Inverter-driven condenser fans reduce waste even further. Innovative free cooling, ambient air and other energy-saving options are also available. Your site and application are unique. Fortunately, we can custom-design your system for any capacity or store size. Additional options include inverter compressor drives, inverter evaporator fans, touch screen controls and monitoring systems with remote alerts. Your ideal solution is here. Bradley Refrigeration leads the way in CRP floor cooler technology. Designed by our highly-experienced team, all machinery is manufactured to the highest standards. Our systems provide high-humidity refrigeration for all vegetable produce, minimising weight loss. If your CRP floor coolers are mission-critical, you need cost-effective maintenance and 24/7 support. We offer both, plus a UK-wide priority response service. Service checks and repairs are conducted by skilled engineers and meet the latest F gas regulations. We can reduce costly downtime. In need of a high-performance quality, cost-efficient CRP floor cooler solution? Call our team in Sheffield on 0114 236 9971 email us for a free, competitive quote.